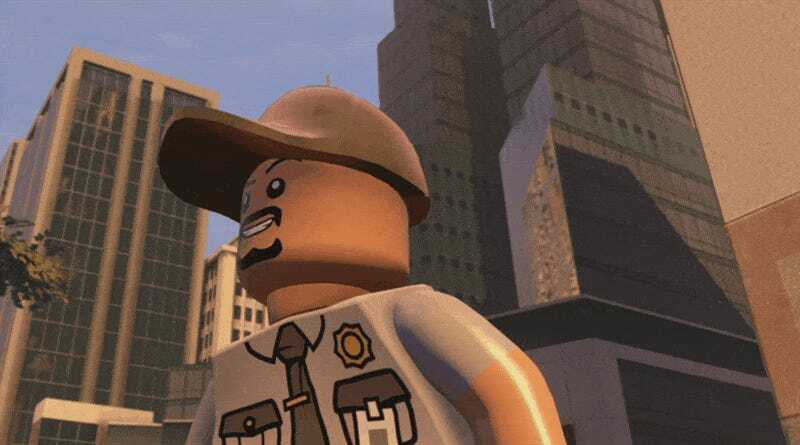 Just like the movie, Michael Peña’s Luis completely steals the show in the currently PlayStation exclusive LEGO Marvel’s Avengers Ant-Man downloadable content. Normally I drop the gameplay audio level to barely audible when doing a Kotaku Plays video with commentary, but that went out the window the moment I realized Michael Peña was going to be narrating the whole thing. He brightens what would otherwise have been a pretty standard adventure with an anti-climactic finish. The final showdown between Yellowjacket and Ant-Man is a series of button presses, but who cares? We’ve got this guy on our team now. Luis with Ant-thony, both a playable character and a ridable character. Outside of the Ant-Man adventure Luis is a security guard with a gun, S.H.I.E.L.D. clearance and some excellent lines. With his best friend Ant-thony by his side there is nothing he can’t accomplish. Other notable minifigures included in the DLC are Cassie Lang in her pre-hero form, wielding that horrible rabbit Scott gives her in the movie . . .
. . . and Janet Van Dyne as the Wasp, who shrinks when she flies, as she should. As long as she doesn’t get too small. The Luis DLC for LEGO Marvel’s Avengers is now available for free to PlayStation 3 and PlayStation 4 players. No word on when it will come to other platforms, but it probably will.